LG&E and KU has installed their 9th level 2 electric vehicle charger!! The charger is located at 201 Main Street in Elizabethtown, KY. With two dedicated parking spots, drivers of plug-in electric vehicles can get a charge while enjoying downtown Elizabethtown. 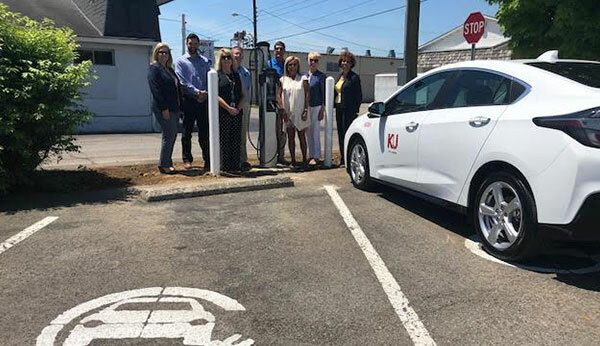 The commitment to installing charging stations is an example of LG&E and KU’s dedication to support environmental sustainability in our communities. LG&E and KU has committed to install 20 public EV charging stations across the state. To date, nine stations have been installed. There are five chargers installed in LG&E’s territory and four installed in KU territory. Other locations are being determined to best serve electric vehicle drivers in the region. These will be in public access areas, such as street parking, parking lots and outdoor areas.